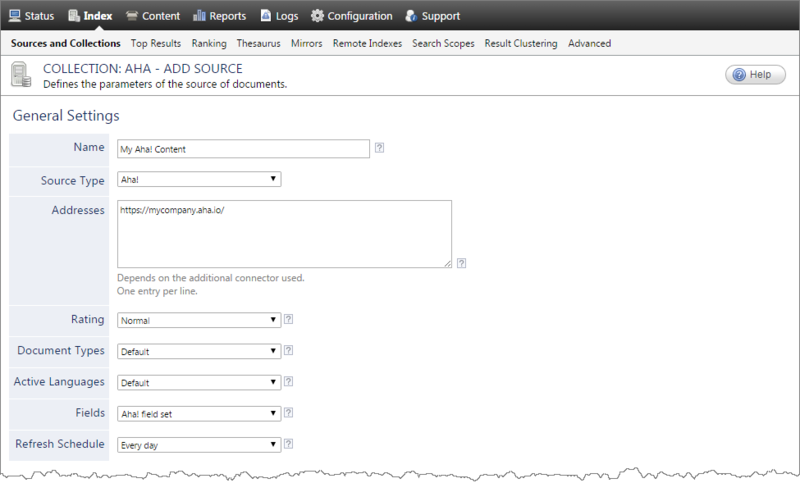 A source defines a set of configuration parameters for indexing the content of a specific Aha! account. The connector used by this source. In this case, select Aha!. where you replace [domain] by your Aha! domain. If you created an Aha! field set, select it(see Aha! Connector Deployment Overview and What Are Field Sets?. Because the Aha! connector does not support incremental refresh, keep this value. Consider using a shorter interval when your Aha! content changes frequently within a day and you need to have a better search result freshness (see What Should Be the Frequency of Source Refresh Schedules?). Note: You can create a new or modify an existing source refresh schedule (see Creating or Modifying a Source Schedule). Change this value only when you want to globally change the ranking associated with all items in this source relative to the rating of other sources (see Understanding Search Results Ranking). Example: If this source is for a legacy PLM, you may want to set this parameter to Low, so that in the search interface, results from this source appear later in the list compared to those from other sources. If you created a custom document type set for this source, select it (see Creating a Document Type Set). Otherwise, leave Default. In the Access token box, paste the access_token value that you obtained previously (see Granting the Connector Access to Your Aha! Content). In the Mapping File box, leave the default mapping file name (Coveo.CES.CustomCrawlers.Aha.MappingFile.xml) unless you created a custom mapping file, in which case, enter the full path of your valid mapping file. Check to index all subfolders below the specified starting addresses. In the Security Provider drop-down list, select a security provider such as Email that resolves permissions to emails (like the Aha! connector does) so that users authenticated with their email address in a Coveo search interface can see the Aha! content to which they have the read permission. Click Save and Start to save your source configuration and start indexing.